Thank you for taking the time to complete this Parent Exit Interview. Your responses will help us improve on our mission to produce gentlemen and scholars. Please complete your responses by June 28, 2019. What aspects of the DeMatha community seemed to have the most profound impact on your son? Your response could be subdivided into an academic area, an extracurricular activity, or even persons in the community. Would you recommend DeMatha High School to another family? If so, why? If not, why? If you could make a change in the school's curriculum, what would it be? When you consider the reasons your son attended DeMatha High School did it meet you and your son's expectations? Which of the student services played a positive role in your son's growth at DeMatha? 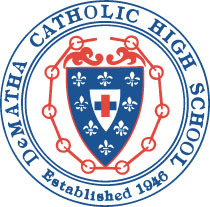 Some people have said that the faculty and staff is the strongest component of DeMatha. 1) If you care to reference a specific faculty or staff member, please do so. 1) Please use the space below if you would like to comment on the DeMatha faculty or staff member(s) you have referenced above. 2) If you care to reference a specific faculty or staff member, please do so. 2) Please use the space below if you would like to comment on the DeMatha faculty or staff member(s) you have referenced above. 3) If you care to reference a specific faculty or staff member, please do so. 3) Please use the space below if you would like to comment on the DeMatha faculty or staff member(s) you have referenced above. 4) If you care to reference a specific faculty or staff member, please do so. 4) Please use the space below if you would like to comment on the DeMatha faculty or staff member(s) you have referenced above. 5) If you care to reference a specific faculty or staff member, please do so. 5) Please use the space below if you would like to comment on the DeMatha faculty or staff member(s) you have referenced above. 6) If you care to reference a specific faculty or staff member, please do so. 6) Please use the space below if you would like to comment on the DeMatha faculty or staff member(s) you have referenced above. If you do not think that the faculty and staff is the strongest component of the school, what in your opinion is the strongest component of DeMatha? If you could do one thing to improve DeMatha, what would it be? Do you have any advice for an incoming parent? Do you have any final comments, compliments, criticisms you would like to share with us?